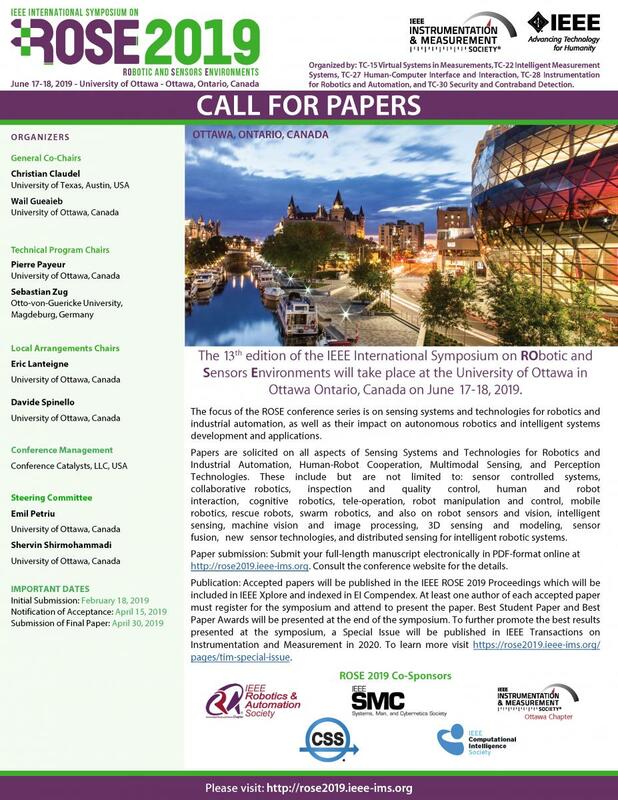 The 13th edition of the IEEE International Symposium on RObotic and Sensors Environments will take place at the University of Ottawa in Ottawa, Ontario, Canada from June 17-18, 2019. Papers are solicited on all aspects of Sensing Systems and Technologies for Robotics and Industrial Automation, Human-Robot Cooperation, Multimodal Sensing, and Perception Technologies. These include but are not limited to: sensor controlled systems, collaborative robotics, inspection and quality control, human and robot interaction, cognitive robotics, tele-operation, robot manipulation and control, mobile robotics, rescue robots, swarm robotics, and also on robot sensors and vision, intelligent sensing, machine vision and image processing, 3D sensing and modeling, sensor fusion, new sensor technologies, and distributed sensing for intelligent robotic systems. Submit your full-length manuscript electronically following the Author Instructions. Accepted papers will be published in the IEEE ROSE 2019 Proceedings which will be included in IEEE Xplore and indexed in EI Compendex. At least one author of each accepted paper must register for the symposium and attend to present the paper. Best Student Paper and Best Paper Awards will be presented at the end of the symposium. To further promote the best results presented at the symposium, a Special Issue will be published in IEEE Transactions on Instrumentation and Measurement in 2020. To learn more click here.